The lid covers the top main opening to the rucksack. These can be fixed to the rucksack or they may have a floating design that allows the main compartment to be extended vertically. To ensure water does not creep under a floating lid into the main compartment when the lid is extended a little, some designs also have a baffle linking the lid to the body of the sack. These straps are found on the sides of some rucksacks, and allow you to compress the body of the sack to help stabilise the load. They are also useful for stashing items onto the side of the pack, such as trekking poles or tent poles. Many rucksacks have mesh panels that hold the sack away from the body, to increase airflow and thereby reducing the horrid clammy sensation that some rucksacks produce. The greater the airflow across the back, the less clammy you will feel. Originally designed for avalanche probes or ‘wands’, these pockets on the side of a rucksack are often made of stretchy mesh fabrics, and are ideal for stashing the ends of trekking poles, as well as smaller items including water bottles or snacks. This is designed to carry most of the load if the pack is heavy. It should fit snugly around your hips, be comfortable and easy to adjust, yet stiff enough to support the load without distorting too much. Rucksacks designed specifically for women are more likely to fit female body shapes better in this area. At least one external zipped pocket is useful for guidebooks, maps and GPS receivers, but some people like more, while others can tolerate less. Stretch pockets without zips are commonly placed on the front of the rucksack, and these are ideal for stowing waterproof jackets between showers. Zipped side pockets are great for drinks bottles, flasks or food. IT'S GOOD The Pinnacle benefits from an A1 adjustable back system that allows the shoulder straps to be raised on vertical alloy bars. The padding on the body contact areas is well placed, and firm enough to give a very stable and comfortable carry with heavy loads that compares well with higher priced packs. Importantly, the floating lid has a baffle of material linking it to the main body to prevent water creeping into the main compartment. The body has top entry and front entry, and there are zipped side pockets, as well as side compression straps and stretch wand pockets. A useful front stretch pocket is ideal for stashing wet waterproofs. Overall this is exceptionally good for the price. HOWEVER Although you could remove the 95g raincover, this pack is still very heavy. Also while the comfort is better than others at its price, if you can extend your budget you can get the same level of stability with more airflow and a slightly softer feel to the body contact areas. The main drawback here is that it does not come in a women’s specific version, and while the back length is adjustable some women may find the shoulder straps and hipbelt don’t fit as well as a women’s specific design. The pair of zips that provide front access to the body could be removed to save weight and cash without any loss of performance for me. VERDICT Exceptional performance with heavy loads at this price, but it’s heavy and there’s no women’s specific design. IT'S GOOD This popular and relatively lightweight rucksack has been updated for 2018. The Vari-Quick back system allows the shoulder straps to be adjusted vertically to suit different back lengths. You get a pronounced air chimney up the centre of the pack between raised body-contact areas of padding overlayed with perforated mesh. The hipbelt is stiff and well contoured too, and generally this feels very supportive of light to heavy loads. The body has top entry to the main compartment via a floating lid and there is base entry too. There is a stretch front pocket, stretch side wand pockets and compression straps. The carry is more stable than other low priced packs. HOWEVER You do get that air chimney but you get even more airflow on some higher-priced packs with mesh trampoline designs. Also the padding is quite firm, so while this is better than others around its price point, if you can pay more you get a more even and softer carry across the body. This is a light pack, but at just 50 litres with the extra 10 litres coming from raising the lid, other packs have more capacity. Also, like other packs some care is needed to ensure the floating lid is adjusted to keep rain out of the main compartment. Other packs have additional side or front pockets and raincovers. VERDICT Relatively light and well-priced, with a very stable carry and good airflow, but less capacity than other packs. IT'S GOOD The nylon-bodied Kulu is great for travel, with a hipbelt that can be folded onto the base and buckles that clip to the sides of the pack to make it neater and more compact. Side haul handles also make this rucksack easier to lob into luggage racks. The back system allows the shoulder straps to be raised and secured with Velcro, and there’s a die-cut moulded panel with a mesh covering sitting against the body to increase airflow. The hipbelt is particularly wide, stiff and well-padded. The main compartment has base and front entry, as well as a floating lid. You get mesh wand pockets on the side and compression straps. HOWEVER This pack appears heavy compared to others, but it includes a very robust removable 226g raincover, so remove this and the weight is a much more acceptable 1803g. The carry is slightly unusual as the hipbelt is exceptionally supportive, the shoulder straps are a little narrow and the back panel tends to barrel a little to create a firm contact area in the middle of the back. Some others were more comfortable, allowed more airflow across the back and tended to hug my body better for a more stable carry, particularly at the shoulders. Also, as with others, the floating lid design needs careful adjustment to stop water creeping into the main compartment. VERDICT Design is useful for travel, and if you ditch the raincover the weight is good, but carry and comfort not the best. IT'S GOOD This has a large capacity and a unique non-floating lid design, so there is a section of material between the lid and the body of the pack to prevent water seeping down into the main compartment. For typically wet British conditions this is a real benefit. The Biofit back system allows back length adjustment while wearing the pack, while most are only adjustable when not being worn. Entry to the main compartment is via the lid, a front zipped access and a base zipped access. But you also get two massive zipped side pockets under the compression straps and above the mesh wand pockets. On the back the raised padded areas allow reasonable airflow. HOWEVER I found the shoulder straps tended to dig in more than others around the sides of the chest under the arms. Also, while the body contact areas are minimal – to allow more airflow – some higher-priced packs with the mesh trampoline design allow even more airflow, are softer on the body and also create a more stable carry. This is not the lightest pack available, but it does have a bigger capacity and carries heavy loads better than the lighter sacks, and you can ditch the 93g raincover if you want. The top of the sack is a bit wobbly due to the taller design. But all these niggles need to be weighed up against the competitive price. VERDICT Well-priced for bigger loads, with the benefit of a fixed lid, but not as good as higher-priced packs for comfort. IT'S GOOD The low weight is the instant appeal of this rucksack, coupled with its competitive price. But it’s also made from 50% recycled polyester, and uses more eco-friendly waterproof treatment on the materials. The back length is adjustable, with perforated mesh providing airflow across the padded body contact areas. The main compartment gets base, front and top entry via a floating lid. There is a huge front pocket and the compression straps work well with the deep mesh side wand pockets. The carry is acceptable with light loads, and some will like both the relatively firm and stable feel of this pack and that the weight does transfer well to the wide hipbelt. HOWEVER This rucksack is firmer in body contact areas and there is less airflow across the back, so this is best used with lighter loads to compensate. The capacity is smaller than other rucksacks too, so you do need to have the lid and pockets expanded fully to reach a similar capacity to others. Many higher-priced rucksacks use more durable nylon, rather than the polyester used here. Like others, the floating lid needs to be carefully managed to ensure no water creeps in, although this one does cover the top of the pack better than most. The lid pocket zip does not get an external storm flap, so it leaks easier than others. VERDICT Good lightweight pack for use with smaller and lighter loads, but not the most comfortable option and if you pay more there are benefits. IT'S GOOD New for 2018, this pack is designed to be low in weight but also practical. The new ZephyrAD back system is adjustable on the pack by raising or lowering the shoulder straps, and has moulded panel air pockets with a mesh covering to allow more airflow. The main top entry has a removable floating lid but also a base compartment with external entry, which is useful. Two huge mesh stretch pockets have zipped access and are great for wet waterproofs. You get side mesh wand pockets and hipbelt pockets like other packs. All that for just 1811g is good, and that includes a 121g removable raincover. HOWEVER Other packs offer even more airflow across the back, and also have a stiffer back and hipbelt for carrying heavier loads in more comfort. The back panel barrels a little, and as it isn’t held away from the body with a trampoline mesh panel it isn’t as comfortable as the higher-priced packs. 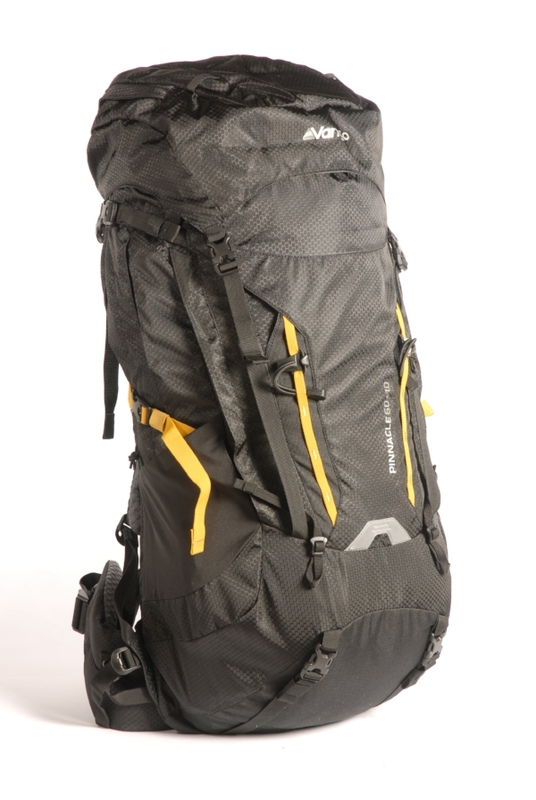 Best kept for light loads, although even then not quite as comfortable as higher-priced packs. Care is needed to prevent water creeping under the floating lid into the main compartment. The side mesh pockets are quite shallow, so not the best for stowing a water bottle, and the side compression straps don’t get quick-release buckles. VERDICT Good for this price for light loads, but lacks the comfort of those with a mesh trampoline that hold the pack away from the wearer’s back. IT'S GOOD The Anti-Gravity (AG) trampoline-style back system holds the body of the pack away from the body of the wearer, to provide maximum airflow with exceptional comfort. The fit is also good thanks to the hipbelt in particular moulding to the body, but there is also good weight transfer of the load to the hips, due to the stiffness of the design, and loads are carried with good stability. The main compartment has a top entry with a floating lid and an additional Flapjacket cover that allows you to remove the lid if needed. There are two massive front-zipped pockets behind the stretch stash pocket and you get pretty much all the packing options you need here. HOWEVER This is a heavy pack, although the weight does include a 123g raincover, which you could remove, as well as the additional Flapjacket cover under the lid, which you cannot remove. It would have been good to have just a normal drawcorded snow lock extension under the lid and ditch the Flapjacket, but that is the only niggle here. Like many floating lid designs, water could creep under the back of the lid and make its way into the main compartment if you are not careful with adjustment of the lid in the rain. The price is high, but you are getting improved comfort and better stability in some cases for the extra cash. VERDICT Superb rucksack for bigger loads when airflow, comfort and stability are all top of your must-have list, but the price may be a load too big to shoulder. IT'S GOOD Gregory is known for its very supportive packs for hauling heavier loads, but for 2018 it has introduced a new lighter design of pack with an Aerospan back system featuring a trampoline of mesh to hold the pack away from the wearer. The main body of the sack has a top entry with a floating lid, which can be replaced with a more basic lid (supplied) to save about 50g. The body of the sack is a single compartment with a stretch front pocket, stretch side wand pockets and compression straps. The big benefit of this pack is the weight of just 1245g with the standard lid, and that includes a removable 89g raincover. HOWEVER Other packs in the 55-65 litre capacity have far more features, such as base compartment access and additional pockets. More importantly, some other packs of this volume also have a better heavy load carrying capacity, so this one is best kept to light loads. The floating lid can drop forward if not carefully adjusted and it would be nice if the side compression straps had quick-release buckles. So the weight benefit is great, but you are getting a lot less here for your money compared to some other backpacks around this price. If you don’t mind these drawbacks, this pack is very good. VERDICT A very good lighter-weight pack for smaller, lighter loads but the price is high compared to the features on other packs of this capacity. IT'S GOOD For bigger loads the extra capacity of this pack combined with its extra stability sets it apart from others. The X-Transition internal aluminium frame is very supportive, twists between hip and shoulders, and transfers weight efficiently to the very supportive hipbelt. The back system is adjustable over a very wide range, so it should fit many users. The body of the pack is made from robust nylon so will take plenty of abuse. The main compartment has top and base access, but also front zipped access, and you get a large front zipped pocket as well as one large zipped side pocket. The lid can be removed and worn as a bumbag. HOWEVER This is very heavy but you could remove the 124g raincover and perhaps remove the overly large buckles from the lid that allow it to be used as a bumbag. The back system doesn’t quite have the airflow or comfort of the absolute best packs, but it is more stable and better with heavier loads, so your need for this pack does depend how heavy your gear will be. Like many other packs, some care is needed to ensure water does not creep under the floating lid into the main compartment. Many modern packs have hipbelt pockets and a large front stretch pocket for waterproofs, but you don’t get those here. VERDICT Good pack for bigger and heavier loads, but the pack is heavier too and lacks some of the pockets and airflow of other designs, while its price is challenging.